Tungsten is usually mined underground. Scheelite and/or wolframite are frequently located in narrow veins which are slightly inclined and often widen with the depth. Open pit mines exist but are rare. Most tungsten ores contain less than 1.5% WO3 and frequently only a few tenths of a percent. On the other hand, ore concentrates traded internationally require 65-75% WO3. Therefore, a very high amount of gangue material must be separated. 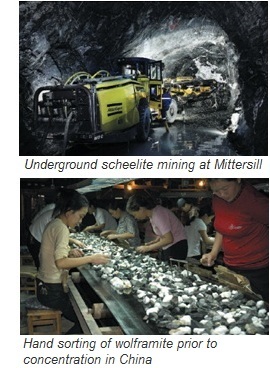 This is why ore dressing plants are always located in close proximity to the mine to save transportation costs.